Here's something the Samsung Gear S3 can do that other smartwatches don't – it can play your Spotify tunes offline! To get going, you must download a Spotify add-on app for the smartwatch through the Gear Manager app on your paired smartphone. Following which, you'll have the option to choose playlists, songs, and albums to be saved right onto your Gear S3. This way, you will be able to listen to some of your favorite music when offline and not connected to a smartphone. 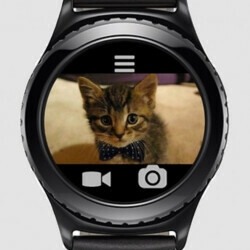 With this functionality on board, the Samsung Gear S3, which runs Tizen OS, becomes rather unique as the only smartwatch able to play Spotify tunes offline. Android Wear 2.0 smartwatches have similar functionality for Google Play Music, but the Spotify app for AW doesn't have the offline feature. However, the Gear S3 won't hold onto this exclusivity for too long, because team Spotify is working on offline playback feature for the Apple Watch app, too. This could be the reason why Spotify is yet to officially announce the offline playback possibility – it might be waiting until it's ready on watchOS, so it can make it official for both smartwatches and their platforms. The whole situation is a bit messy, for Samsung initially announced offline playback for the Gear S3 in Swedish, but quickly pulled down the press release after. Thus, at present we aren't even sure Gear S3 users are able to access the feature, though it's beyond doubt that it's coming. If you happen to be able to activate it on your Gear S3, do let us know in the comments below! Nov 29, 2016, 5:44 AM, by Nick T.
Best smart watch.... with best OS. Definitely, Apple watch fanboys can be so jelly. Apple watch needs a redesign,total overhaul. Until then it is a kids' toy. And at least two-day battery life, charging everyday was a nightmare. Haha. Its funny causes it true! Best Smart watch out there, loving mine. I have 3 extra bands. Having had several BT-only watches before getting the original Gear S and then S2 3g, I would not ever go back to BT-only. I don't see enough value in the watch if you must have your phone with you for anything besides bare minimal GPS functionality. So both AW and Apple are out for now I tried the LG Watch Sport. It feels like a prototype with no interchangeable bands and terrible battery life And when Apple's cheapest new watch is $369 and you are stuck overpaying for different bands (unless you shell out separately for the hideous adapter) . And until Apple has a standalone watch that can go a truly full day with the screen always on, I wouldn't give it a second look. Even if the Apple Watch gets it, the Gear S3 has more onboard usable storage, which means it will hold more tunes. When the gear s3 got iPhone compatability, I sold my Apple Watch, didn't need it anymore. Ooooooh. Mxyflashmite isn't going to like that statement. LMAOOOOO! He's boiling as I type this.